Today I've been collating my images from Iceland and Japan, with the thoughts of putting together two future book projects. I've been struck by just how much work I've done over the past three years in each location, but also, how much is still incomplete in the sense of producing a book on each subject. Playing around with sequencing of my central Iceland photographs. Visualisation is key in propelling me forward with what I do. By collating the work and laying it out in a visual sequence i'm able to build an emotional connection to how I see the work panning out as it continues to be supplemented with new work. This can be very inspiring for me, and I often find myself dreaming up some additional images in my minds eye. This aspect of visualisation is usually down to 'lost opportunities' - those 'photographs that never were', as you spied them while passing by some place, or because the weather changed and you failed to make them on time. They leave an indelible mark on your imagination that trigger strong feelings of 'I must return here, as I know I am not finished with this location yet'. As a result of all this visualisation and dreaming of expanding the work, there have been for the past few years, ongoing discussions with my Icelandic and Japanese guides as to new places I wish to research and photograph. Everything is a work in progress. This is all good stuff as it gives me purpose: I can see that there are still unfinished ties to each of the locations I've already made photographs in. What is most exciting for me, is that I am acutely aware that I often underestimate how much new work will come out of further explorations. New work often enriches existing work by allowing it to take on a new identity. Sometimes I feel the work is one thing only to find out that once I'm done adding new work to it, that it has become something different entirely. And I find that just very inspiring. Collating one's own work is a great way of figuring out what you've achieved, and where there are missing gaps in the work, and which direction you need to take it. 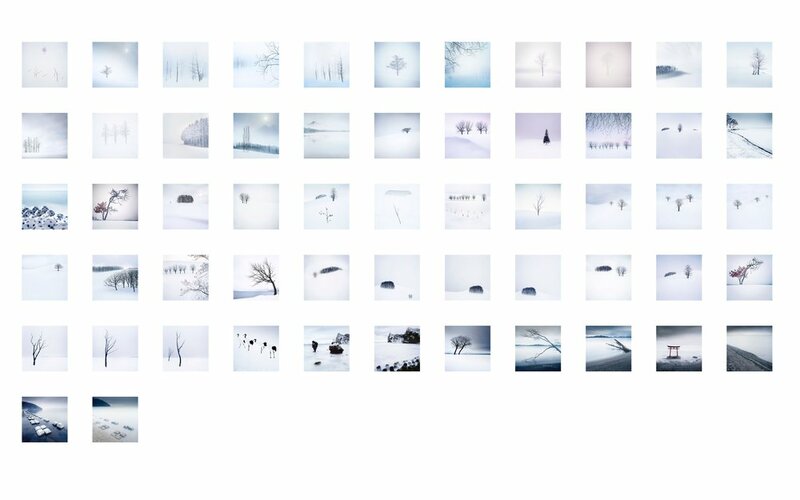 Playing around with sequencing of my Hokkaido photographs.